The Malti Poo is an intelligent, loving dog. The mix of Maltese and Poodle usually produces a lively, playful dog devoted to its family. The Malti Poo loves to play or curl up on the couch for a nap. Malti Poos require frequent human companionship. The Malti Poo is an intelligent, loving dog. The mix of Maltese and Poodle usually produces a lively, playful dog devoted to its family. The Malti Poo loves to play or curl up on the couch for a nap. Malti Poos require frequent human companionship. The Malti Poo can get along well with dogs and other pets if socialized when young, but it is somewhat territorial. Malti Poos may be wary of strangers and are highly protective of their family. Malti Poos get along very well with children, but should be supervised around young children to ensure they are treated respectfully. You can find Malte Poo puppies priced from $250 USD to $5000 USD with one of our credible breeders. Browse through our breeder's listings and find your perfect puppy at the perfect price. Malte Poo Puppies for Sale - Shipped Worldwide! Finding the right Malte Poo puppy can be dog gone hard work. PuppyFind® provides a convenient and efficient means of selecting and purchasing the perfect Malte Poo puppy (or Malte Poo puppies) from the comfort of your home, 24 hours a day, 7 days a week. Take advantage of our PuppySearch or leisurely browse our directory of hundreds of dog breeds, Malte Poo dog breeders, Malte Poo dogs for adoption, and Malte Poo puppy for sale listings with photos and detailed descriptions. 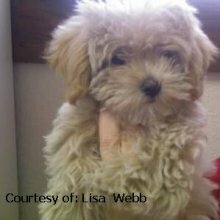 Some Malte Poo puppies for sale may be shipped Worldwide and include crate and veterinarian checkup. Many Malte Poo dog breeders with puppies for sale also offer a health guarantee. With thousands of Malte Poo puppies for sale and hundreds of Malte Poo dog breeders, you're sure to find the perfect Malte Poo puppy.